Enerpac’s focus is to provide hydraulic tools and solutions that make jobs safer and easier to perform, increase productivity and minimise outage and downtime time at every stage in the lifecycle of a power-generating facility, upstream, midstream and downstream. Enerpac products are used for plant construction, ongoing, routine and unplanned maintenance, through to final decommissioning. With more than 50 years of experience, Enerpac has gained unique expertise in delivering hydraulic solutions for the controlled movement and positioning of structures. This expertise has been acknowledged by the world’s leading industrial professionals and has contributed to the successful movement of a number of the most recognisable structures on earth. In addition to providing the most comprehensive line of globally-supplied, locally-supported products, Enerpac combines hydraulics, steel fabrication and electronic control with engineering and application knowledge, to design and manufacture solutions that ensure your projects are completed safely and efficiently: heavy lifting, levelling and weighing systems, synchronous lifting and hoisting, jack-up systems, strand jack systems, strand jack gantries, skidding and stage lift systems, load positioning systems, hydraulic gantries, self-propelled modular units (trailers), incremental launching equipment, self-erecting towers, platform launching and lifting, subsea cylinders and permanent hydraulic installations. Enerpac bolting equipment provides precise and effective force to make your work more productive, safer and easier to perform. From joint assembly, controlled tightening and torque wrench pumps to joint separation, Enerpac’s bolting equipment, tools and accessories offer the solution best-suited to the project, from one source. Our selection of cylinders and lifting systems is fully supported and available through the most extensive network of distributors worldwide. We have a solution for virtually any application – lifting and jacking, lowering, levelling, pushing, pulling, bending or holding, testing, stressing and tensioning – in most industrial and commercial work environments. Enerpac offers hundreds of different configurations of hydraulic cylinders and lifting systems, plus products ranging from hydraulic jacks and lifting bags, for portability and tight fits, to engineered systems for precise control over multiple lift points. Enerpac combines the widest selection of high-pressure hydraulic pumps available with reliability, durability and built-in safety to make it easy to find the right pump for any application requiring applied force. 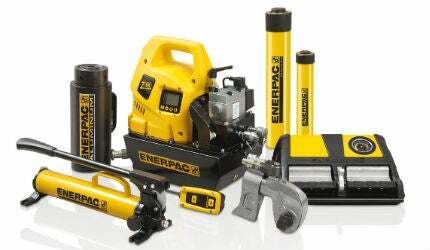 Available in more than 1,000 different hydraulic power unit configurations, including hand pumps, foot pumps, battery driven pumps, to name a few, our range perfectly matches Enerpac’s family of hydraulic cylinders, tools and accessories. Our high-pressure hydraulic pumps and valves offer a lifetime warranty, and are designed to make work performance more productive and efficient. All the additional elements you need to complete your hydraulic system can be sourced through Enerpac. With our extensive line of system components and valves, Enerpac has the accessories to complement your system and ensure the efficient operation, long life and safety of your hydraulic equipment. Enerpac offers an extensive range of dedicated tools for a variety of specific and flexible applications. Whether it is cutting, punching, spreading or bending, Enerpac has the correct tool to do the job safely and efficiently. Hydraulic and mechanical pullers, maintenance sets, punches, lifting wedges, machine lifts, spread cylinders, hydraulic cutters and pipe benders are just a few of the hydraulic tools Enerpac can supply. Across every continent, Enerpac’s network of authorised distributors and service centres can reach even the most remote locations, supplying and servicing products that are designed to enhance productivity and performance, while making the workplace safer. With more than 150 sales specialists and a network of service and engineering support in 17 countries worldwide, Enerpac has become the product of choice in industries such as manufacturing, construction, energy, oil and gas, power generation, shipbuilding, railroads, mining and metals transformation. Enerpac is fully committed to the health, safety and security of our customers and employees along with the safety and protection of the facilities and communities where we operate and conduct business. Every facility and subsidiary abides by the highest safety standards to protect our customers, our employees and the environment. All of our products and solutions are designed, manufactured and carried out within a quality management system in accordance with ISO 9001:2008 (quality management).